E.O. Wilson was recently interviewed on KUOW 94.9 FM in Seattle, Washington regarding his latest book, The Meaning of Human Existence. Harvard Professor Emeritus E.O. Wilson has spent most of his 60-year career in pursuit of evolutionary biology. His studies of and writings about ants and their social organizations earned him the moniker “the father of sociobiology,” as well as a a bevy of honors and awards, including two Pulitzer Prizes and a U.S. National Medal of Science. Now, at the age of 85, Wilson has widened his intellectual curiosity beyond biology. 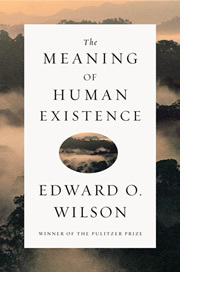 Wilson’s latest book has the audacious title The Meaning of Human Existence. It’s the second volume in a planned trilogy. Wilson says these days he’s interested in what he calls the big questions. He maintains that scholars have avoided these questions, even considered them presumptuous. But Wilson says that’s far from true. In his latest book, Wilson stresses the need for closer ties between scholars in science and the humanities. “I think it’s important for the survival of humanity,” he says drily, then starts to laugh. The esteemed biologist believes that it’s now harder, and far more expensive, than anytime in the past century for scientists to come to any new discoveries. These days the nuggets have all been scooped up, and scientific prospectors must invest significant time and dollars drilling deeper into their subjects, with ever-tinier yields on their investments. Wilson muses that if extraterrestrial life exists, they’ve probably already achieved the scientific knowledge we have on Earth. He hopes philosophical questions might spark new fields of inquiry for scientists, and vice versa. Wilson was born in Birmingham, Alabama, in 1929. He had a keen interest in natural history from a young age, but Wilson was blinded in one eye in a fishing accident at the age of seven. He was still able to see small objects up close; perhaps that fueled his lifelong study of insects. Wilson says he never imagined that his fascination with the natural world would lead him to his current focus on philosophical questions. Wilson says he found his joy and the meaning of his life in the study of evolutionary biology and species diversity. Wilson retired from his Harvard professorship almost a decade ago, but he still heads the E.O. Wilson Biodiversity Foundation, now based out of Duke University.